Did it! I am a Marathoner! So I did it! I survived! 26.2 Miles – done! 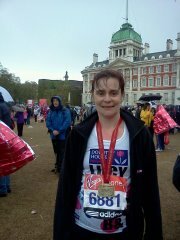 I have done the London Marathon, I have the medal and am (still) wearing the T-shirt. Truth be told, I only took my medal off because I realised I’d got sunburn on the back of my neck and the ribbon was rubbing it. It took me 6:07, I took my little walk breaks every mile as planned, and I ran the last couple of miles, passing so many walkers. My husband and kids managed to dash around London and see me SIX TIMES! (I think they deserved a medal as well.) The noise and support from the crowds was great, although at times I did find it a little over whelming. Well, I run on my own, usually on little country lanes with just a few cars, tractors and the wildlife to keep me company. I need to write a proper race report, if only to get it all straight in my head. I also have various pictures my husband took along the way. But the main thing is phew and hooray! Did it! Previous Previous post: 3 Days To Go!